Bradlee Dean -- Chris Kyle and His Murderer - Is Anyone Paying attention? CHRIS KYLE AND HIS MURDERER - IS ANYONE PAYING ATTENTION? The Navy had confirmed 160 kills to Kyle’s credit. However, both he and his comrades counted double that number. Because of his high success rate of taking out American enemies, there was an $80,000 bounty put on his head. As a result, Chris Kyle’s wife Taya stated, “He died because someone wanted to kill him.” And kill him, they did. The Chris Kyle murder case is taking precedent on many headlines across the country. Kyle was shot 6 times while his friend Chad Littlefield had been shot seven times by Eddie Ray Routh, who is claiming mental insanity as his defense. In addition, it was reported both Chris Kyle and Chad Littlefield texted one another while the trio drove to the gun range, “This dude is straight-up nuts.” One has toask why two tried and true intelligent military men would take a man like this to a gun range. Now, we know that Routh’s defense team are attempting to make him out as the victim who made a choice to kill two innocent men by claiming that he suffers from post-traumatic stress disorder and other mental illnesses that clouded his perception of reality. We know that Routh did not serve in the military in such a capacity in which he could claim PTSD, due to the fact that he was never in battle. We also know that Routh was in and out of mental hospitals after having “suicidal thoughts” following his discharge from the Marines in 2010. It was reported that he was released from a mental hospital about a week before the slayings and given anti-psychotic drugs. If those in the military,who are diagnosed with depression anxiety or some other form of “mental illness,” refuse to take those prescribed drugs, then they are kicked to the curb by the government that they served. Why are the medical institutions prescribing drugs to Americans that were illegal “street drugs” back in the 50’s? What most Americans may not be aware of is the fact that these are the same dangerous drugs that are being pushed on anyone that may be vulnerable and ignorant of the facts concerning these prescriptions. While Routh and his defense team continue down the road of attempting to paint the picture of a poor victim who “didn’t know right from wrong,” consider that Routh is a full-grown man drinking whisky along with smoking marijuana, dangerously mixing these two substances with anti-psychotic drugs. He then makes the choice to kill two of America’s finest and rolls through Taco Bell for two burritos. Does that sound like a victim to you? Me neither. Mr. Routh can’t credibly cry that the “devil made me do it.” It is clear that the choices that he made in service to the devil are the ones that have him in the predicament that he is in today, period. These were the words of Leon Eisenberg, the "scientific father of ADHD (Attention Deficit Hyperactivity Disorder)," in his last interview before his death. Keep in mind that some of the same drugs that are administered for ADHD are the same drugs that have been prescribed to mass killers. Do you remember the Columbine Massacre? 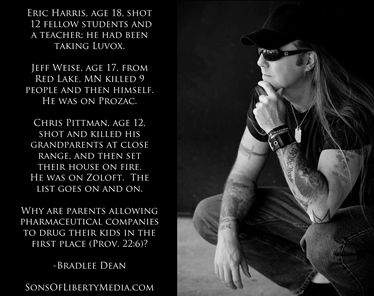 Eric Harris, age 18, shot 12 fellow students and a teacher; he had been taking Luvox. What of Jeff Weise, age 17, from Red Lake, Minnesota he killed 9 people and then himself. He was on Prozac. Or what of Chris Pittman, age 12, shot and killed his grandparents at close range, and then set their house on fire. He was on Zoloft. The list goes on and on. Why are parents allowing pharmaceutical companies to drug their kids in the first place (Prov. 22:6)? This raises the following question concerning these drugs: Are they safe? Am I saying that drugs made Eddie Ray Routh do what he did, or am I saying that drugs made any of the young people I mentioned do what they did? No. However, clearly they were a component in every one of these incidents and, therefore, should be considered dangerous.